Can't find Bonb Benson's excellent article on Den anymore. Does anyone have a copy they can email or pm to me? "I asked, “ What does Den mean in the use of Den Rai Kunitmitsu, etc?” He said, “The Den means that that sword is almost a Rai Kunimitsu.” He said, “We use it meaning almost”. I said, “ You mean the sword is lacking so it is almost a Rai Kunimitsu” He smiled and said “No. That is where the misconception by collectors comes in. In some ways the sword might not have all the traits produced by that smith, but most of them, so we say Den. In this case it may be lacking somewhat, on the other hand it might have all the traits of a Rai Kunimitsu but in addition, it has work that is better or could be considered his best work. In this case it displays greater ability and qualities not normally seen in the smith so here again we use Den." One very important thing to note is that if Den is used before the name of a swordsmith, it is not talking about a tradition. For example, Den Kinju or Den Niji Kunitoshi means in regards to an example of their work that it is not exactly the sum of their known characteristics. In the case of these smiths where many unsigned works have been attributed, the characteristics are formed from old written reports and what can be observed in the realm of the signed works left to us. For smiths with only few (or no) signed works left, it makes it hard to establish a complete reference to their overall style. Given that a smith could work for decades, and styles evolved, it should be clear how difficult it can be to make a perfect reference out of a handful of examples. When Den is used like this, the work may be considered to have a small number of features that are over and above the expectations for the smith, or it may be missing a small number of features. It absolutely does not mean that the work was made (or possibly made) by one of the smith's students and it is not a mark of uncertainty of the attribution. " Who was Kiyosada? Has he had students? Was he the head/leader of a school/trend inside the Sue Nio tradition? Would he have been the head of a school/trend, it would have been Kiyosada den and not Den Kiyosada. Here in the Den meaning, according to Tanobe sensei, your sword has more or less all the features of sue Nio Kiyosada. Thank you Jean for the useful Benson/Tanobe quotation. The interesting thing for me is to see the term used at all as it is so invitingly elastic in meaning. Essentially it says the blade either display "more" or it displays "less," and without saying which. The ambiguity seems so Japanese. In terms of the market place "den" can be spun either way, i.e., as a plus or as a minus. In that it is unspecified as a term it does introduce a measure of uncertainty and therefore lowers the price sticker. What Bob and Tanobe sensei have said is all well and good, but I think it bears keeping in mind that they are referring to the usage of the term from an NBTHK perspective I believe. My response was what I have been told by members of the NTHK-NPO, the group that actually issued the decision under discussion here. I think the best way to interpret their usage of "den: X" is as above. Hi Jean,there are probably 5 Nio-Kiyosada (one 14th,one 15th and three 16th Century with 50 points from Hawley to the last one KIY 438).The NTHK-Kanteisho does not specify which one. "Meibutsu-Japanese swords and sword fittings in American collections-Token Taikai '79"-#42 (with Mei Nio Kiyosada). NIHON TO Koza-Koto Kantei mentions only the one from the 14th Century. You must be able to determine if your sword is ko Nio or sue Nio. 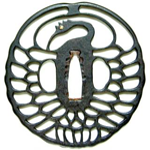 This kanteisho indicates clearly Kiyosada which means that this smith had distinctive forging features/traits, otherwise it would have been mentioned only Nio. So it can be Kiyosada or, if any, a direct student. Studies shows that starting second generation forging characteristics change. Ludolf's link above to David Fuller does not seem to work. I am trying to find out something about Sue-Nio 二王寛清, around 1470 maybe. Just reading his name took more than an hour of cross-referencing and elimination! I know, it's love, isn't it!